Submitted by witness on Tuesday, May 31, 2011. LOCATION DETAILS: on the way to the grassy lake w.m.a. OBSERVED: i went fishing last spring. found really weird tracks. i took pictures. i worked in a hospital at that time. i showed the pics to several ortho doctors and 4 podiatrists (foot doctors). they all said the same thing. "Not made by a person" as in not h.s.s.. i then showed them to several people that hunt bear. they all said "not made by a bear". the tracks had a large toe print,and no arch. they were wider than my size 12 water boot but only 2/3 the length. how do i send these pics to you? they tracks went into an area that was dead ended by 2 creeks. the tracks went in then turned around and went back. the next day i took my go'shein akita out there. he is not scared of anything and has went after a black bear with no hesitation. he hit the tracks, got the scent and turned around and left. i found him back at the car trying to get inside. he hates getting in the car and never does it willingly. he was more than willing then. i have pics of right and left tracks with objects for size reference. ALSO NOTICED: my dog was obviously afraid. OTHER WITNESSES: another guy fishing there saw them. I contacted this witness 6/1/11 via phone, he then e-mailed these pictures and I found them intriguing. I shared these pics with my peers who are more learned than I on the subject and they also found them interesting. But some red flags were raised about how well defined the toes were. So on 6/18/11 I drove to the sight and met the witness,where the pics were taken and studied the consistency of the soil and the surrounding area and found that the ground was very clay like. The density of the soil was when moist (not wet) was the same as drying fine grain concrete, like when kids would leave their hand print and and write their names. I took my own shoes off and found a moist piece of ground and it left the same well defined type of print although different of course as the ones in the pictures. It was at the mouth of a state wildlife refuge of 2000 acres of marshland and forest named Belle Slough. The witness impressed me as being honest in account of the event. The foot prints were approx. 9 inches long and approx. 6 inches wide. As to the question of what if these prints were faked? 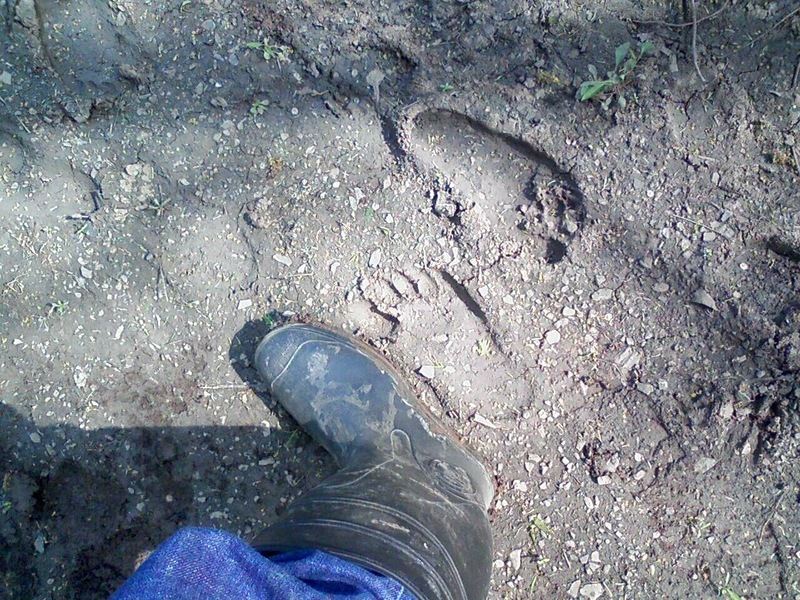 The only argument that I can come up is: if someone wanted to hoax a "Bigfoot " print then why didn't they make it ..bigger? Picture of the tracks taken by the witness.